Prewash your linens before first use. Separate linens from other items in the wash, especially those containing polyester which tends to create pilling and items with heavy zippers which can abrade and damage the fabric. Separate light and dark colors. Avoid overloading the washing machine, which can cause fibers to break down from excessive abrasion and agitation. Wash most linens in warm water on a gentle cycle with a cold-water rinse. Use a mild detergent, preferably non-alkaline, and without added bleach or whiteners. Do not pour detergent directly on textiles; rather, add it to the water as the wash tub fills or dilute detergent with water, then add linens. Unless linens are very soiled, you only need to use half the recommended amount of commercial detergent. Recommend that you do not use chlorine bleach, if possible, as it can weaken fibers and cause them to yellow prematurely. If white fabrics need bleaching, use an oxygen-based bleach. While line drying outdoors is gentle, safe, and imbues linens with the fresh scent of the outdoors and natural bleaching of the sun, it is not always practical. You can machine dry most linens on low heat, but be sure to check the care label. Shake out damp linens before placing them in the dryer. Never use a high heat setting, which is the surest way to weaken the fibers, cause shrinkage, and shorten the life of your linens. Remove them from the dryer promptly while slightly damp to minimize wrinkles. Smooth and fold, or press with an iron if desired. Some hair and skin products such as acne lotions or toothpastes that contain oxidizing agents may cause discoloration of colored sheets and towels. When using such products, it’s safest to sleep on white bed linens. All natural fibers will shrink to some extent, but in most instances fine linens are generously overcut to allow for shrinkage. Washing or, especially, drying linens on a hot setting is most likely to cause shrinkage. Follow the instructions on the care label. Iron linens while still slightly damp on the reverse side of the fabric. Use a steam iron on a warm/hot setting for cotton; use a hot setting for linen and a water spritzer if needed. Iron damask table linens on the reverse side first, then on the front side to bring out the sheen. To iron embroidered linens, iron them on the reverse side atop a towel to preserve the three-dimensional affect of the embroidery. Use a press cloth to protect delicate lace and cutwork. Sateen linens are refreshed by ironing on the reverse side, restoring the lustrous face of the weave. If the label says "hand launder," never machine wash. Hand wash in gentle soap; rinse thoroughly in clean water to eliminate all soap residue, then line dry by laying flat on towels or hang to dry. Avoid wringing linens. Professional hand washing is recommended for the most delicate linens; those with heavy embellishments or embroideries; heirlooms or worn linens. Be sure to use a reputable launderer who knows how to launder delicate linens. Dry cleaning is recommended for luxury fibers such as cashmere, merino wool and alpaca, and also to avoid excessive shrinkage on our formal top-of-bed items such as our Italian matelassé blanket covers. Be sure to use a professional dry cleaner with experience in natural fibers and luxury linens. Store bed linens in a cool, dry, well-ventilated area. Linens stored long-term should be wrapped in white cotton, muslin (old pillow cases work well) or acid free paper. Natural fibers need to "breathe" therefore avoid storing linens in plastic bags or boxes, which can cause permanent yellowing. Cedar chests can also yellow or streak fabrics. Store linen tablecloths rolled on cardboard tubes or hung on hangers (without plastic) to prevent crease marks from setting, which can weaken fibers. Machine wash in warm or cool water using a non-chlorine bleach detergent. Tumble dry on low heat, smooth and fold. Professional dry cleaning is recommended. Store in cedar or with a moth repellent, then air out before using. Many people prefer to launder linen, especially table and bed linens, because the more linen is washed, the softer and more luminous it becomes. Use a gentle detergent, and never use chlorine-based bleach, only an oxygen-based bleach. Line dry or tumble dry on low heat; remove while still damp. Iron while damp (see above 'Ironing'). Linen can also be dry-cleaned. Professional dry cleaning is recommended to preserve these delicate, fine fibers. Professional dry cleaning is recommended. Protect down comforters and pillows from perspiration, soil and wear by always using pillow protectors and a duvet cover, which should be laundered regularly. Fluff regularly and air out pillows and duvets occasionally to help keep them fresh. Machine wash on gentle cycle with warm water. Do not use bleach. Tumble or line dry until slightly damp. Iron with a press cloth or on the reverse side of embroidery (iron atop a towel to preserve the three-dimensional quality of the embroidery). Pre-wash before using to break in the cotton fibers, making towels softer and more absorbent. Cotton terry towels don't achieve full absorbency for several washings. Wash colors separately from whites, in warm water, and do not use chlorine-based bleaches. Do not use fabric softener, as it actually decreases the absorbency of towels. Dry on medium heat. Some of our cotton blankets are machine washable; others need to be professionally dry cleaned for best results. Follow instructions on care label. For home laundering, test out the blanket in each machine to be sure that your washer and dryer are large enough to handle the blanket. To avoid excessive shrinkage, dry cleaning is recommended. If machine or hand laundered, wash in cold water, gentle cycle using mild detergent with no chlorine bleach. Line dry or tumble dry with no heat. Machine wash in cold water using mild detergent with no chlorine bleach. Tumble dry with no (or low) heat to minimize shrinkage. Machine wash in warm water on gentle cycle, using gentle (or non-chlorine bleach) detergent. Tumble dry on low heat. Smooth and fold; ironing is recommended for touch-ups. Forever New is a pure, organic and biodegradeable fabric care wash formulated to gently clean, brighten and promote longer life in all fine washables. 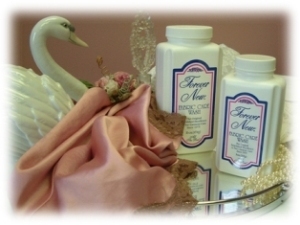 It safely cleans lingerie, hosiery, swimwear, silks, woolens and other colorfast delicates. Le Blanc® Linen Wash®, Inc. has built an outstanding reputation for producing the highest quality specialty cleansers for the home textile industry. 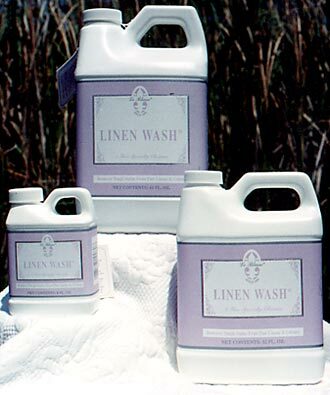 Linen Wash® has a neutral pH balance making it safe for cleaning vintage linens, lace and even precious Egyptian cotton sheets. Yet it is effective in removing stains from red wine, lipstick, "foxing" or aging without the use of bleach, caustics or phosphates. Sleeping in fine quality linens is always a pleasure and proper caring for them will ensure that pleasure to be long lasting and preserve their beautiful apprearance. We recommend washing with Le Blanc and Forever New and following the guidelines listed on this page.